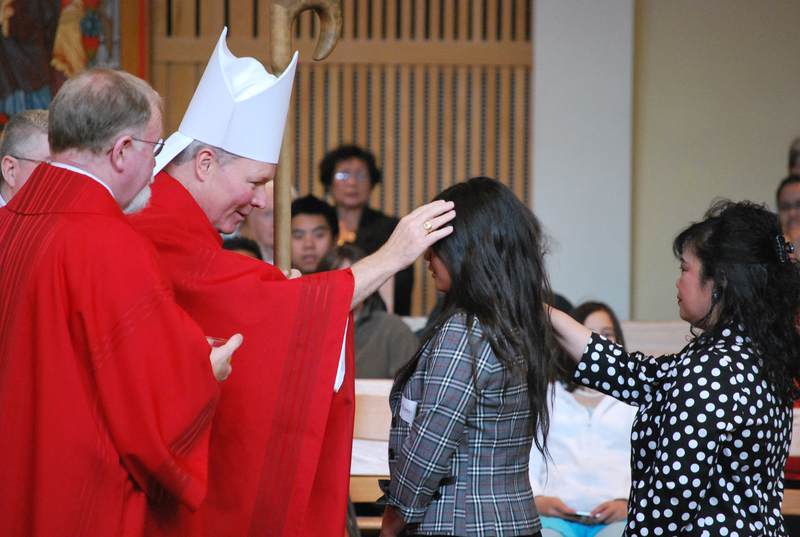 Bishop Edward Burns confirms a young woman at St. Paul the Apostle Church in Juneau, May of 2011. Our life truly changes when we exercise the gifts of the Holy Spirit – trust me! Or rather, trust in the Lord! 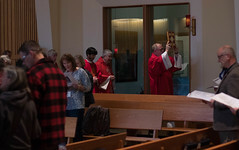 Over the past couple weeks I have been conferring the sacrament of Confirmation upon a good number of people in various parishes. 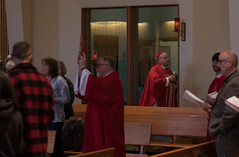 This Sacrament of “confirming” our faith is a grace-filled moment as the Church bestows the gifts of the Holy Spirit upon those who seek to be faithful disciples of the Lord. While these gifts may lie dormant in a person’s life, it is the hope of the Church that these gifts will be exercised. The seven gifts of the Holy Spirit are: wisdom, understanding, counsel, fortitude, knowledge, piety and fear of the Lord. We have to acknowledge that the early disciples were actually quite timid and fearful of witnessing to the Lord. They gathered behind locked doors soon after the Lord’s resurrection and feared venturing out. It was not until the descent of the Holy Spirit at Pentecost that they had a full grasp of what they were called to do – witness to the world about the love, mercy and fullness of life rooted in Jesus Christ. The gifts of wisdom and understanding go hand in hand. Wisdom is the ability to value the truths of the faith and it helps us order our lives in relationship to those truths. In seeking wisdom we desire to contemplate these truths. Understanding is our ability to grasp the importance of these truths in our lives and in our world. Counsel is the fulfillment of the virtue of prudence. While we hope to exercise prudence in our lives, counsel is the ability to be enlightened by the Holy Spirit in choosing what is right. As men and women of faith, we should always acknowledge that God calls us to act as his children and in doing so, we seek to give him glory and strive for our own salvation – through our prayer, words and actions. Fortitude is often referred to as courage. However, fortitude is directly related to the supernatural and to the Holy Spirit as it is the gift of strength to live out the right counsel (decisions) we make as Disciples of Christ. It keeps us focused on doing God’s will here on earth as it is in heaven. Knowledge, although it may seem to be similar to wisdom and understanding, is the ability to judge things according to the eyes of faith – to see and ascertain things as Christ would. Pope Francis has mentioned many times that we should be aware of evil intent in this world. Knowledge is the ability to judge what is good or evil and then proceed in the path of holiness. Piety, the sixth gift of the Holy Spirit, is the internal desire to love God and the external expression of that love. This is seen through our worship and our reverence for the sacred – all that comes from God and leads us to God. We pray that our hearts, filled with reverence and piety, will always express our love for him. Fear of the Lord is our desire never to offend the Lord. One of the familiar versions of the Act of Contrition states, “I detest all my sins because I dread the loss of heaven…” With a healthy respect and adoration of the Lord, we are able to live in the hope of heaven. Fear of the Lord turns our hearts away from sin and evil and helps us look with wonder and awe at the majesty of God. We then live in the fear of ever separating ourselves from God. As these gifts of the Holy Spirit are given to those who celebrate the Sacrament of Confirmation, they may lie dormant within a person. It is the hope of the Church that the gifts given to us will be exercised and utilized. By living these gifts, our lives are changed. We have only to look at the Apostles and the early disciples. They were transformed from being paralyzed by fear behind locked doors to giving their lives completely to witnessing to Jesus Christ. It is my hope and prayer that those who are confirmed will make use of these gifts and truly live the fullness of life promised to us by Christ.